RV owners commonly overlook the toilets in their RVs, mainly because they feel that their first toilet or the toilet that the RV comes with is enough to satisfy the needs of the RV owner and his or her friends and/or family. The truth is, you need your RV toilet to be tough, effective, comfortable and safe. Is the toilet in your RV the way it needs to be? If not, read this review to determine what is the best toilet for RVs available on the market. In this review, we will take a look at five of the finest RV toilets from companies like Nature’s Head, Porta Potti and Camco. We’ll show you all there is to know about each toilet and form there, we will declare the best one to buy for your RV. Is available in two colors. Has a flush pedal for feet. Is very comfortable to sit on. Has large capacities for waste. 2.5 gallons of water capacity. Has large capacities for waste and water. Beveled rim design to prevent spillage. Dometic is known for manufacturing various appliances and fixtures for RV, such as refrigerators and fans. Their toilets, however, are ones that shouldn’t be taken lightly. Dometic’s heightened version of their RV toilet is one that evert RV owner should consider, just based on how familiar that this toilet is compared to the types of toilets that everyone uses at home. The toilet is designed in a way so that when you flush, the bowl is completely washed with water. This toilet comes with a three year parts warranty. If a part breaks off, such as a lever, you can get a new replacement part in the mail. This toilet is available in two colors: white and bone, which is a pale peach color. White is for bathrooms that invigorate and energize, while bone is for bathroom that help users settle down and relax. It is great to have options like this for RV toilets. This is a toilet that does a great job trying to imitate a house toilet. It is big enough to be just as comfortable, too. Flushing with this toilet seems rather underwhelming. There is only one pint of water used, and this water just trickles out into the bowl, which is not what is described by Dometic themselves. Pressure of flush is rather weak. The most affordable toilet in this review is from Camco. This is a portable toilet that can be folded into a cube shape for easy carrying and storage. This is a portable, plastic toilet that can sustain a person as heavy as 330 pounds. This toilet comes in two parts that stack on top of one another: the seat and the waste tank. This is a lightweight toilet. When empty, it weighs 11 pounds. When full, it weighs 32 pounds, still manageable to be carried by just about anybody. We do like that they focus on portability, here. You can take this toilet anywhere, inside or outside the RV, to relieve one’s self. With a small frame that this toilet has, it also has just as large of a capacity for waste like with other RV toilets that are more expensive. Despite the price, we like how there is just as enough room for waste as a pricier toilet for RVs. You aren’t paying less to get less waste capacity, which is a good thing. Just by looking at it, it isn’t a very comfortable toilet to sit on. It is also very small, so you will not find a good position to sit down on, either. At first glance, your guests might not even recognize that it is supposed to be a toilet. The cubic design is meant to be more storage-friendly, but it also looks less like a real toilet by result. Comes with a three-month warranty. 4 gallons of water capacity. Gravity flush feature.Pressurized full-rim flush. 5.5 gallons of waste capacity. Is portable and can be taken out of the RV for use. This next toilet for RVs may look like a toilet from the future, but this is actually a portable toilet with many features built into it, such as tanks for water and waste, a battery and more. This is a portable RV toilet. The upside is that you won’t need to use a macerator to dump the waste, and that you can take this toilet anywhere with you to relieve yourself. If you have a place in your RV where you feel it’s a good place to put toilet, you can easily do so. The downside is that this toilet runs on batteries. When this toilet has no charge left, it cannot flush again unless the battery is replaced. This can be an ongoing expense that you might not prefer. This toilet comes in white or grey. It is good to know you have options, and if you prefer a toilet color other than white, you can do that, even though the colors aren’t that much different from one another. This toilet is light and easy to carry, weighing as much as a bucket of kitty litter. As the toilet is movable, being able to move it is not a challenge at all. The warranty only lasts for just three months, we’re afraid. Not three years, but months. The warranty is likely just for defective parts that you might happen to find and other things that might have happened as this toilet gets shipped and transported. You have plenty of time to look for defects, but that is pretty much it. Furthermore, this toilet is just too small to be comfortable to sit on. We only recommend this toilet for small women and children. Composts waste to create manure. Nature’s Head offers us a self-contained composting toilet. This is not only a toilet suitable for RVs, but also for boats, cabins and more. This toilet can turn human waste into fertilizer, which is great for farmers. This is not a normal toilet, this is one that turns excements into fertilizer with the crank of the handle, so that you have better use for your waste rather than just to dump it somewhere. The hardware of this toilet is made of stainless steel so that this toilet can last quite a long time. Like Porta Potti’s toilet, this is a great toilet for when you do not want to deal with a macerator pump. You will have to deal with the manure one way or another, however. If you have a use for the manure later, consider this to be an attractive buy for you. Like Dometic’s toilet, this is a large toilet that imitates the shape and comfort of a house toilet. Due to its large seat, it can provide you with a relaxing place to sit as you go. But granted, you may need a little extra room for the toilet itself. Owners of this toilet can also enjoy a five-year warranty, which is a generous amount of time to determine if anything is wrong with the toilet. With a price this high, we would expect the toilet to be made of gold. This is quite a lot of money for a toilet for an RV; close to the quadruple digits. This might be a hard ask of RV owners considering they might only want a place to lay cable. This next toilet comes from Thetford. It is a very affordable toilet for RVs that resembles the same ones as the toilets you have in your home. The toilet is a sleek, white color. This is a lightweight toilet, overall that is suitable for all kinds of RVs. There is a very good chance that there is room in your RV for this toilet. Even though it’s a very light toilet, it is not considered a portable. This is a basic RV toilet, to say the least. If you only want a toilet without spending lots of money to getting some unusual gimmick along with it, then this is a toilet to consider. The pedal at the bottom is reasonably easy to reach, and you can push it with either your hand or foot. Like Porta Potti’s toilet, this toilet, while it’s not as small, is still rather small for the average male. We don’t really tout this toilet for it’s comfort, considering that the seat is smaller than we prefer. This toilet also has a brief warranty window. You only have time to take a look at it for about 3 months before the warranty expires. How to install a toilet in an RV. If you have a toilet that you want to replace, you can replace it without question. Before attempting to replace the toilet in your RV, you should first measure the size of your RV bathroom, length by width. While you undoubtedly have a new toilet that will very likely fit in your bathroom, the real question is how well will it fit. You are likely going to get a toilet that is a little bigger in size, but you likely would still prefer to have enough room for your legs as you sit on it. The new toilet also needs to be able to fit right over the drainage hole, and shouldn’t get in the way of any walls or doors. If the measurements of the new toilet are favorable for you, you should feel confident and should proceed to install your new toilet. Turn the water supply off in your RV. To remove the old toilet, unscrew the water connection and take out the nuts that are secured by the bolts that extend from the closet seals on the bathroom floor. Once the screws are taken out, you should be able to remove the toilet and take it out of your RV. On the bottom of the extension, slide in a new seal. Then, take your new toilet and align it directly where the bolts will go. Place the toilet right onto the mounting bolts. If there is carpeting inside the bathroom, you will need to cut it with a box cutter, as most quality RV toilets require to be mounted directly on the floor of your bathroom. With a wrench, tighten the nuts on your bolts until the toilet doesn’t move or wobble. RV toilets do not use wax rings or gaskets like toilets in your home do, but they still need to rest firmly on the bathroom floor. To be sure that your toilet is stable, sit on it and lean back and forth. If the toilet moves along with you, it is still loose and you will have to tighten it some more. The toilet needs to be immovable so that it stable in the event that the RV drives up or down a slope or hill. Finally, reconnect your water lines with your new toilet with a box end wrench. Then, turn the water supply back on and flush the toilet. While it is flushing, look at any fittings or any possible leaks, and make adjustments where need be. Dry any puddles of water that might have appeared as you installed your new toilet. With additional amenities? Like spouts and hand sprays. Some toilets for RV come with additional amenities that you will very unlikely able to buy seperately, such as additional waste tanks, spouts and hand sprays. Warranties can also be considered amenities, as they are included with the product to get consumers to make a purchase. Of course, with additions to the toilet for RC, the price of the toilet is sure to be higher, so we feel that buying toilets with additional amenities to be worth it if you feel that those extras are necessary to have. How long and where will you be traveling? If you are looking to go on a long and fascinating trip in your RV, without the thought of having to frequently empty your RV’s waste tank, your toilet system needs more accommodations that are necessary so that you stay comfortable as you use it each time. You can always add more waste capacity by simply buying a toilet that comes with extra capacity for waste, such as a portable or cassette toilet. These toilets have their own waste tanks so that you are not required to set up the macerator pump and aimlessly find a place to dump your waste legally. What if I have elderly people boating my RV? Do you have elderly people on board your RV? If so, choose high toilets so that is is easy and comfortable for seniors to sit on. Low-riding toilets, just like inside your own home, may be challenging for disabled and elderly people to get on, and especially get off of. If you have an elderly person in your RV, be sure that there is also plenty of room allotted to them in order to get situated, have a place to put their possible walking aids and more. With the tightened spaces that RV bathrooms are used to having, they are not that suitable for elderly and handicapped people, but that doesn’t mean you can make some tweaks and changes in the bathroom in order to make due. How much space is available for your toilet? For bathrooms in campers, it really does pay to have as much space in the bathroom for your toilet as possible. With more room, users can relax easier and can relax their backs, legs and other body parts without putting any muscles strain on them. If your bathroom doesn’t have enough room for you to relax, you are certain to have a sore and uncomfortable experience as you relieve yourself. But what if you don’t have much room for to have a servicable experience in the bathroom? It isn’t out of the ordinary to expect a restroom in an RV that has limited space and an unorthodox layout. There are toilets that you can buy in the event that your bathroom has limited space. Low-profile toilets come with a small footprint fit within tight spaces, and this allows users to sit comfortably without feeling cramped at all. Low-profile toilets can even allow users to add raised platforms so they can sit down on the toilet seat like normal. Compact pedal-flush toilets are toilets that have a simplistic design to them, so they can also fit inside of a narrow space. There is no side handle to flush, but instead, there is a foot pedal on the base of the toilet for the user to push with either his or her hand or foot to flush the toilet. Then, there is what is known as a cassette toilet. Cassette toilets have 360-degree base-to-bowl rotation, allowing the user to turn as he or she is seated so that they can find a comfortable position as they sit down to go. The best RV for toilets is none other than the Dometic 320 Series Standard Height Toilet. Allow us to explain our decision. 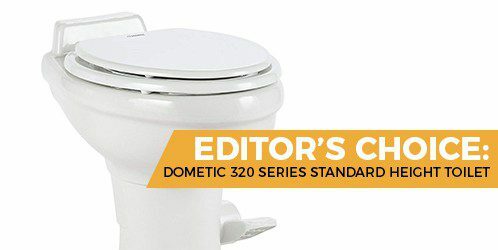 The Dometic 320 toilet has a familiar, elongated shape to it that makes it rather feel less like an RV toilet and more like your toilet at home. The size of this toilet makes it so that the toilet is comfortable to sit on and will support your thighs, legs and buttocks. If you have the space for a Dometic 320 toilet, we strongly suggest that you get it so that you can relieve yourself with actual relief. We assure you that this is the comfiest toilet that you can buy for the RV. If not for the absence of a back rest, we would have rated this toilet five out of five stars. The runner-up in our review is the Porta Potti Curve. While we like what it does, what it does simply does not make it the best.